Smoke from the Camp Fire in Butte County has created "very unhealthy" and "hazardous" levels of air quality in the Bay Area, per EPA standards, and it's not expected to get much better until next week. It's no wonder, then, that residents around the Bay have been trying to access more information about their air. Most of us have been clicking on the EPA's air quality website, AirNow, which allows you to type in your zip code and see the Air Quality Index (AQI) for your area. AirNow hasn't been able to handle the crush of traffic, and the site has been crashing intermittently since the smoke descended upon the Bay Area. "The AirNow website is still experiencing very heavy traffic and may be slow," the agency said on Facebook and in a tweet. According to a spokesperson from the EPA, 3.2 million visitors hit the website from Nov. 9 to 15, with as many as 21,000 concurrent users. That's 100 times more simultaneous users than usual, the EPA said. The outages have prompted some very angry comments from the public. "Your website is broken. We are kind of in a state of emergency right now," wrote one user on Facebook. Wrote another: "Please fix it. You are depriving people from accessing crucial info that will affect their health. Hire adequate developers who would run it normally. One of the factors affecting the site's performance was that AirNow upgraded to a new interface in September, and the site's expanded functionality required more server resources. When the site became overloaded this week, AirNow started redirecting users to parts of the old site to spread out the traffic. But some of the new links didn't work on the old site and some of the old maps wouldn't load. So AirNow decided to revert fully to the old site, which has made the service more stable. It's not just AirNow site that's struggled to meet the demand. 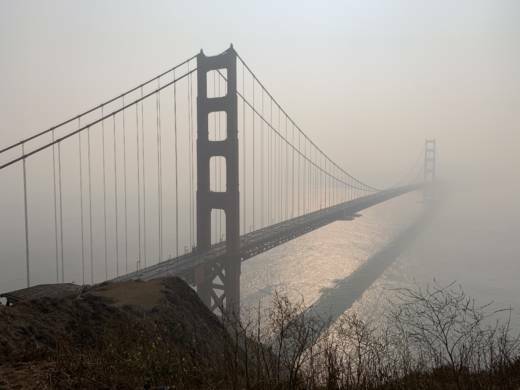 The Bay Area Air Quality Management District's website has been getting 300,000 page views per day, according to a spokesperson, a 6,000 percent increase in traffic. The agency had to increase server and database capacity to handle the load. PurpleAir, which is a small private company that creates portable personal air monitors and uses a wi-fi open source network to map the air quality via that equipment, also succumbed to traffic overload Thursday night. "This is much bigger than expected. Through the fires this summer we did not experience this sort of traffic," said Amanda Hawkins, one of the company's founders. The good news: Most of the sites have now upgraded their back-ends to handle the traffic. AirNow, for instance, is back to providing AQIs on a more granular geographical level. The other good news: There are other places to get your air quality information, if one site isn't loading. AirNow partnered with the U.S. Forest Service's Wildland Fire Air Quality Response Program to send users to its site when necessary. The U.S. Forest Service increased their service capacity Thursday to take on some of the additional traffic. See the U.S. Forest Service's Air Monitoring site here. The California Air Resources Board also runs a Breathewell site designed for mobile users. BAAQMD.gov increased its server capacity and provides an air quality map, as well as pure data. The 31 actual air monitors around the Bay Area that feed the AirNow site come from BAAQMD. The World Air Quality Index is a global project, based in Beijing, that provides AQI information for 1,000 cities around the world. You can view the AQI at the nearest station to you. PurpleAir also provides a map made up of data from its own network of personal air monitors. The difference, though, is PurpleAir provides rolling updates—so the AQI is the most recent 80-second average—whereas the AQI on AirNow or BAAQMD is often a 24-hour average with an hourly estimate based on calculations. PurpleAir uses a different type of monitor, a cheaper and more portable laser particle counter, which can read slightly higher than sensors that measure particulate matter by mass concentration. KQED's map is updated hourly, based on the open data from AirNow, and includes info about the air quality categories. You can also try the AirNow website again. It appeared to be working more reliably throughout Friday.